VVDI2 Full Version comes with Basic Function + VW + BMW + Porsche+PSA+ AUDI Generation 5 Function+BMW OBD Fucntion+BMW CAS4+ Functions +Tango + J2534, No Need to buy other Authorization. VVDI2 Covers All the Functions of VVDI, VVDI 5th IMMO Adapter, BMW Multi Tool, CAS4 Adapter, Tango & J2534. 1.backup coding and restore coding can direct operation generally. 4.when operation on 'programming FEM/BDC system'interface,please don't close this software window until all procedures completed. 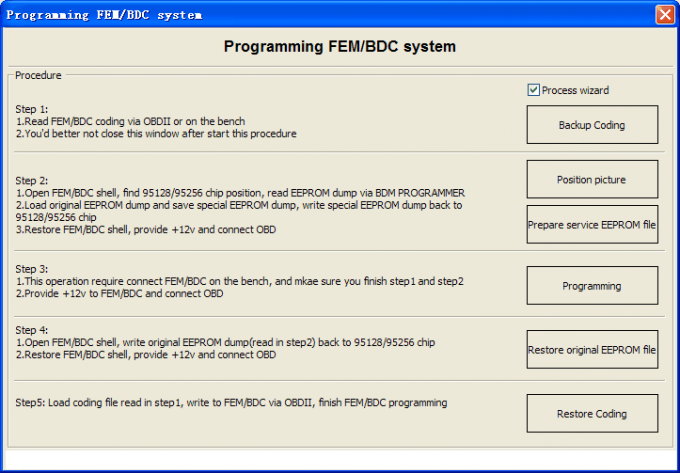 5.programming FEM/BDC system, require soldering and get eeprom. (FEM 95128 chip, BDC 95256 chip)usually there are 2 same chips on the module, please refer to the software diagram, select the correct one. 7.if connect power to FEM/BDC module, but the relay keep ringing,please contact technical support for help.usually operation on FEM/BDC should be ok,just need to programming. Notes: for 4.3.0 software users just download 4.3.1 can use directly,no need update firmware again. 4. Attention: FEM/BDC Key Learn is an option function, it require buy license or exchange with bonus points. Contact your dealer for help! 5. Improvement for "Lost all key via OBDII"
you can download them above Related Download Files Section. VVDI2 supports diagnostic function only for VAG groups, But VVDI2 has achieved multi brand vehicle diagnosis and supports part of vehicle immo programming function and software online upgrade. Can connect BMW plug to realize OBD function, And meanwhile reserve some connectors for further uses. ODIS, Toyota TIS techstream etc. 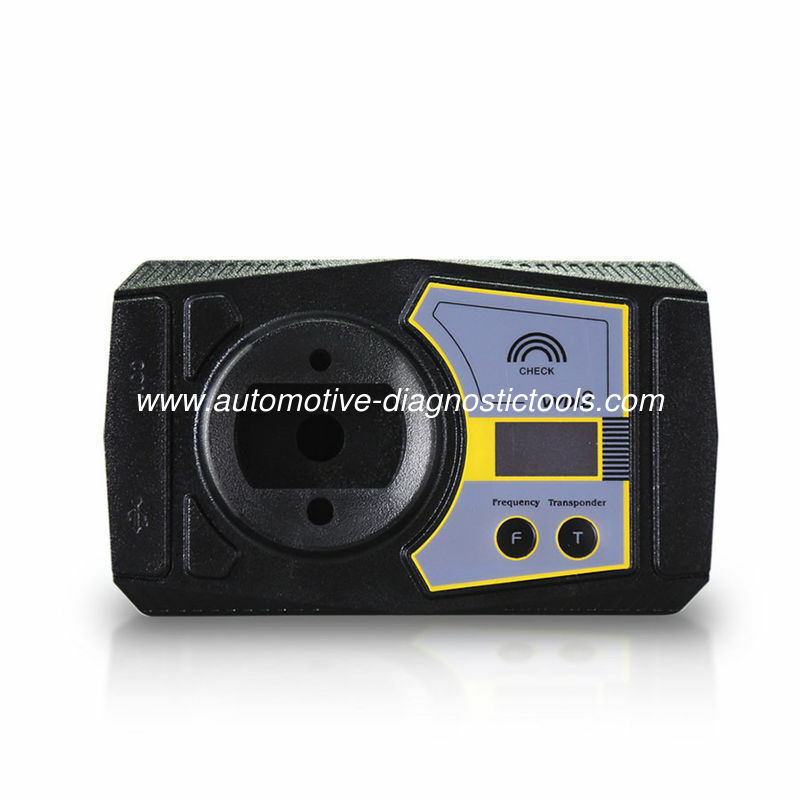 To perform VVDI2 diagnostic function, third-party diagnostic software should be compatible with J2534 function. (2). You can exchange it with "Transponder Programmer -> Menu -> Points System"
In future, points will have more power function, save as more as you can! VVDI technician has devoted themselves to VVDI free update online and update service in the pass five years. This is what VVDI has been widely respected and ranked as a power tool. There is no doubt that the more power and high-end configuration VVD2 will inherit the fine traditions. Apart from free update online service and system optimization, more powerful functions and vehicle models (Like Porsche) will soon be available via update. And other more functions. 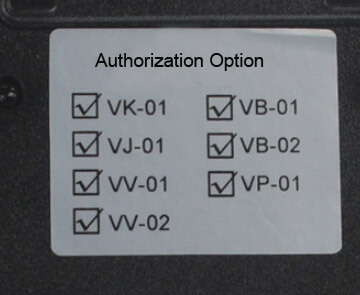 VVDI2 goes beyond than VVDI in function, connectors and vehicle coverage etc. After all, VVDI belongs to locksmith tool while VVDI2 becomes a comprehensive locksmith device. VAG software support VAG cars: VW, Audi, Seat, Skoda, 4 th immobilizer Porsche, 4 th immobilizer Bentley . Read/Write KM stored in CAS, synchronization DME with CAS, synchronization CAS with ELV, Key Learn(immo),File Make Key, Unlock Key, File Change KM, CAS Repair etc OBD Flash ISTA version only need 10 minutes. (No extra power. No backup CAS EEPROM and FLASH). 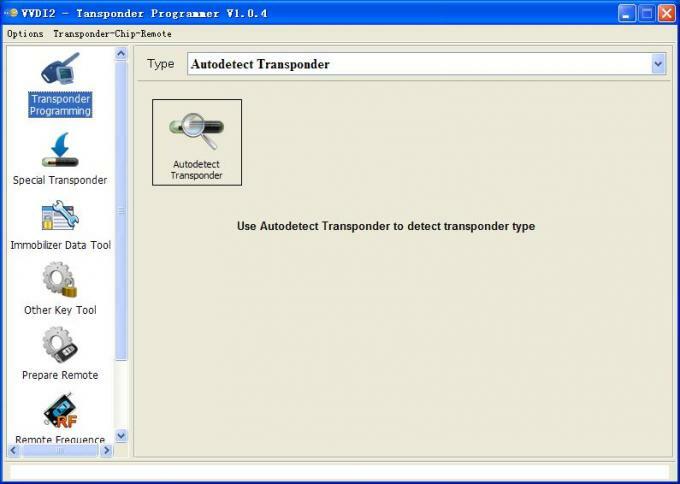 Transponder programmer software is a multifunctional immo transponder tool. Mainly include: transponder programming, special transponder, immobilizer data tool, other key data, prepare remote etc. -Successfully add a key bcm2 on a 2013 audi a5. 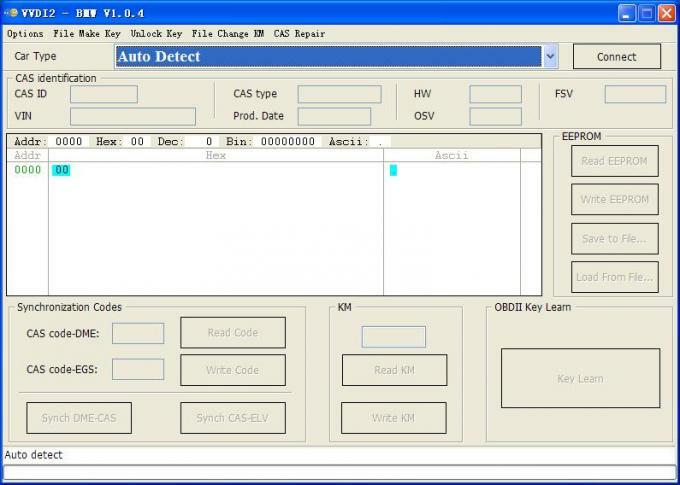 -Audi BCM2 add spare key by obd worked fine, and I did one on a 2013 A5 and it worked flawlessly. -A6/Q7 EZS Kessy: Added a dealer key (remote sourced from the dealer) without issues. Seemed to read everything properly but I had a working key to begin with. -Skoda Octavia 2006: got CS & PIN , programmed key fine, but not remote programming. -VW passat. B5: Pulled PIN, programmed key, corrected miles. -VW Passat B6 2009: Pulled PIN but couldn't get 6 bytes CS, needed comfort dump. 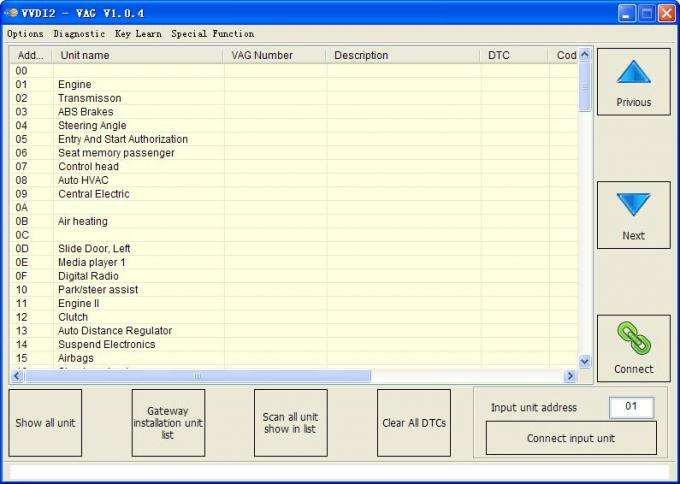 -VW Transporter T5 2006 : Pulled PIN Programmed key, no remote programming. -Audi A4 2006 : mileage correction success . -Audi A6 2003: Mileage correction fail. car not start. remove battery terminal. car start.